Surely the Canucks needed to bounce back in a big way from the pile of excrement that was left on the ice from Wednesday night's game in Saint Paul. Luckily, they came out with the W in this one. Starting with the very first shift, the Canucks showed more giddyup, more energy, more urgency, whatever you want to call it. Interestingly enough, it was triggered by the game-opening line of Ryan Kesler/Todd Bertuzzi/Matt Cooke as coach Marc Crawford had decided to mix up the lines a bit (Richard Park filled Bertuzzi's spot on the top line with Brendan Morrison and Markus Naslund). Early on, Morrison lost a puck and it was shot off of Sami Salo's stick by Brent Burns and out of play, though Dan Cloutier couldn't find it. Jarkko Ruutu and Filip Kuba exchanged some pleasantries, further underscoring the Canucks' commitment to setting the early tone. Ruutu had a shot deflected off the base of the post, and Lee Goren was hooked at the side of the net. Scott Ferguson was whistled for the hook, putting the Canucks onto the power play, where they had been scoreless on their last 14 tries. Daniel Sedin pass to Anson Carter in front of the net, who whiffed on the first try. The puck went to Willie Mitchell, who sort of tried to clear the puck, but it hit his stick and went back to Carter, who stuck it through traffic and past Dwayne Roloson. Todd Bertuzzi took a 30-foot slapshot on a three-man rush, but that's somewhat passable since it's still a shot on the net, and the skaters were all parallel to each other. Dwayne Roloson gave up an Ed Jovanovski rebound and covered it up when Morrison crashed the net. Bertuzzi got to a Steve McCarthy rebound, though it didn't go through. Roloson later played the puck out of the goalie zone behind the net, putting the Canucks on the power play, which was killed, though it took a while for the Wild to clear the puck from their own zone. Pascal Dupuis pulled a spin-o-rama and was all alone in front of the net, and couldn't get a shot off, though Cloutier had already sprawled. Roloson made a great stop on Daniel Sedin on a rush, who was set up by Carter. Sami Salo got beaten by the new rules, taking down Derek Boogaard before the latter got a shot off (the radio crew thought it was debatable anyway). Salo went to the box for cross-checking, but the penalty was killed. The Canucks outshot the Wild 13-1 in the first period, easily their best of the year. They were 9-for-19 in the faceoff circle, which at least was better than Wednesday's game. Early on, Trevor Linden heeled a rebound in front of a wide-open net, surely leading to speculation over whether Linden has anything left (he got better a better shot later). Filip Kuba put up a shot, Wes Walz avoided a check and backhanded the rebound past a sprawling Cloutier after Jovanovski didn't take out his man at the blueline. Vancouver had outshot Minnesota 20-4, yet the score was tied. The Canucks got a favorable break when Pascal Dupuis couldn't get a good shot away on a 2-on-0 rush where the Canucks were caught up the ice. Ferguson and Goren dropped the gloves and traded blows shortly after Ruutu had gotten away with a headbutt. Shortly after, Bryan Allen knocked down Kyle Wanvig, who sold it a bit, and Minnesota went onto the power play. Randy Robitaille fed a nice pass to Perre-Marc Bouchard near the net, and Cloutier had no chance. Linden missed his man. Despite leading 25-5 in shots, Vancouver was now behind by a score of 2-1. Naslund backhanded a puck off of Morrison and off the base of the post. Salo had a shot stopped, and Morrison was tackled. Filip Kuba went off for interference, but the ensuing power play was lackluster. However, the Canucks eventually mounted some pressure. Linden got off a better shot, a quick one that was stopped. Allen wristed a puck that Jovanovski deflected, and Roloson was lucky when he stopped it. He wasn't so lucky when Naslund changed directions behind him, spun around, then put the puck in the crease, where it went off Ferguson's skate and through the five-hole. A fluky goal, sure, but it was a big one that tied the game at 2-2 for Vancouver. On a great backcheck, Park stole the puck and pass from his own blueline to Ryan Kesler, spawning a breakaway. Kesler finished it off with a deke to the backhand, roofing it over Roloson for the lead. The Mat Cooke took a bad penalty, putting his stick on the hip of the puck carrier and giving a little tug. Kuba took a long slapshot which Cloutier stopped and covered (no rebound). Linden failed to clear a puck, and Rolston unloaded a long slapshot that was deflected somewhere by a Canuck stick and past Cloutier. More pleasantries occurred after the final horn of the period, when Mattias Ohlund bearhugged Andrei Zyuzin. Vancouver outshot the Wild 18-8 in the period and 31-9 after 40 minutes, yet the game was tied at 3-3. Go figure. That's what the Wild seem to do, though. It didn't take long. Park and Naslund came on a rush and went to the left circle while Naslund went toward the net as the decoy. Park unleashed a wrister from the circle that beat Roloson. After that goal, it didn't help Minnesota to take two third-period penalties. 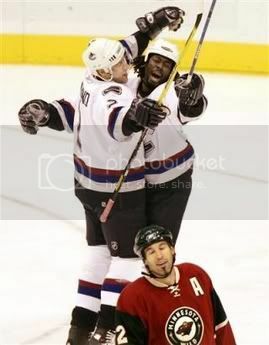 After a Jovanovski shot was stopped, Naslund was shoved after the play, and Bertuzzi and Mitchell had some words. Park nearly got a second goal on a rush with Naslund. Eventually, it got to the point where Roloson was pulled for an extra skater. A Matt Foy shot was blocked and cleared. Allen centered for Bertuzzi, who missed the empty net. A Burns shot was stopped shortly after, and Bertuzzi got another chance. He didn't miss. Vancouver outshot Minnesota 10-4 in the period and 41-13 overall. A complete and total 180 from Wednesday was exactly what the doctor ordered here. The Canucks more than dominated on shots, though Minnesota crushed Dan Cloutier's save percentage, but scoring on very little shots is what Minnesota does. With Bryan Allen's assist on the Richard Park goal, the Canucks are down to four scoreless players on the season: Lee Goren, Steve McCarthy, Wade Brookbank, and Jarkko Ruutu. Markus Naslund leads the team in points with 7, Sami Salo has 5, Richard Park has 4, Henrik Sedin has 3, then a bunch of guys have 2. Markus Naslund has 5 goals, and no other Canuck has more than 2. For the game itself, Bryan Allen was a plus-3 skater in addition to his assist. Unsurprisingly, Naslund and Park were a plus-3 given the goals in which they were involved. Ed Jovanovski was a plus-2. Mattias Ohlund and Nolan Baumgartner were plus-1. All other skaters not named Steve McCarthy (who was minus-1) were even. In the faceoff circle, the Canucks improved to 42% from the 36% night on Wednesday. Sadly, no Canuck was better than 50% in the circle, and Park and Daniel Sedin only took two faceoffs apiece. Brendan Morrison was 6-for-14, Trevor Linden was 5-for-12, Ryan Kesler was 6-for-13, and Henrik Sedin was 6-for-15. Not better than half, sure, but at least there was marginal improvement over Wednesday. Ed Jovanovski led in shots with six, and Todd Bertuzzi had five. Bryan Allen delivered five hits. An interesting thing mentioned on the postgame blip afterward was how in many doubleheaders (they played in Minnesota Wednesday as well) that occur in college or junior, most people will tell you that a lot of the doubleheaders end in a split. This was no exception. Of course, a split means that you're playing at .500, so to me that might be a bit worrisome, but oh well. Other things talked about by the radio crew include how weird it is that the Canucks' next road game is at Minnesota after the four-game homestand, how good of a game Bryan Allen had (that's encouraging), and how the Vancouver power play doesn't really seem to take off until the Sedins hit the ice. Where do they go from here? The Canucks have a four-game homestand which will see them face Dallas, Chicago, Phoenix, and Colorado before going right back to Minnesota on the 25th. Then two in Denver. Yikes. The Canucks are 3-1-1 (shootout loss in the third column), good for seven points in the standings.